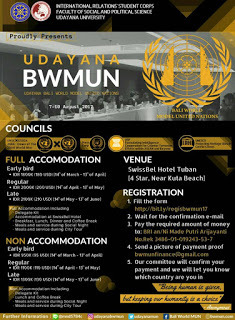 International Relations Students' Corps of Udayana University proudly present you Bali World Model United Nations. The BIG day is here! The early bird registration of Bali World Model United Nations has officially opened now with "Journey of Humanity : A Mission for Peace" as our theme! This time, BWMUN 2017 would host 5 different and challenging chambers, which are: UNSC, UNESCO, ARF, UNGA, and PRESS CORP, aiming to preserve peace. We look forward to see good diplomats out there, showing up their commitment and courage for a better earth by keeping the peace.